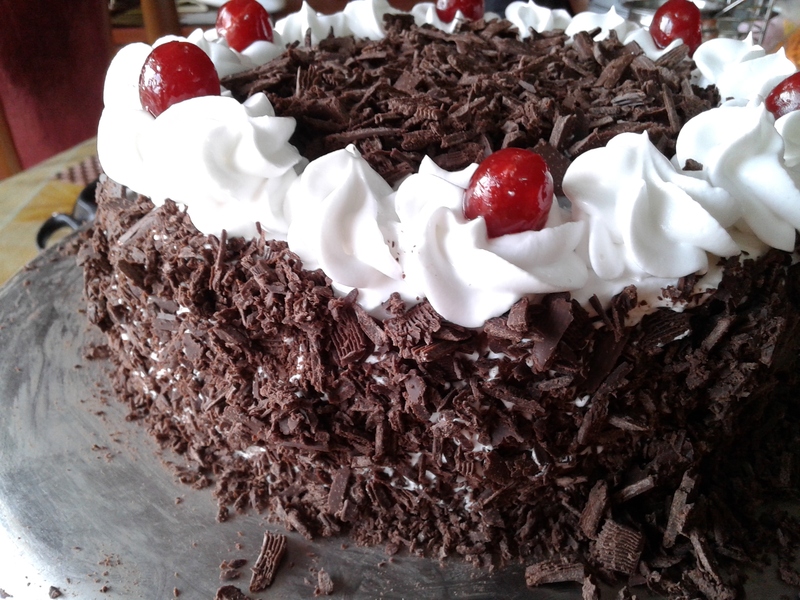 Black forest cake is wonderful example of German baking tradition. 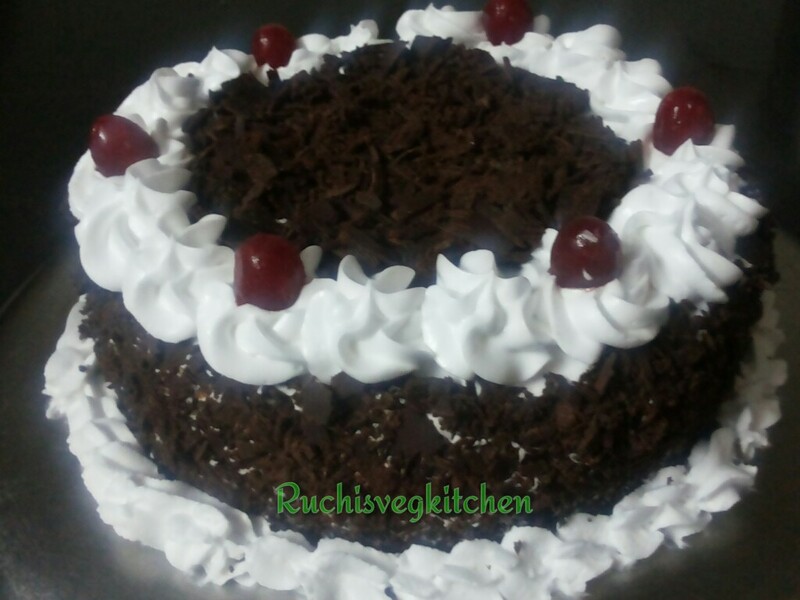 A different chocolate cake with a high layer of cream. 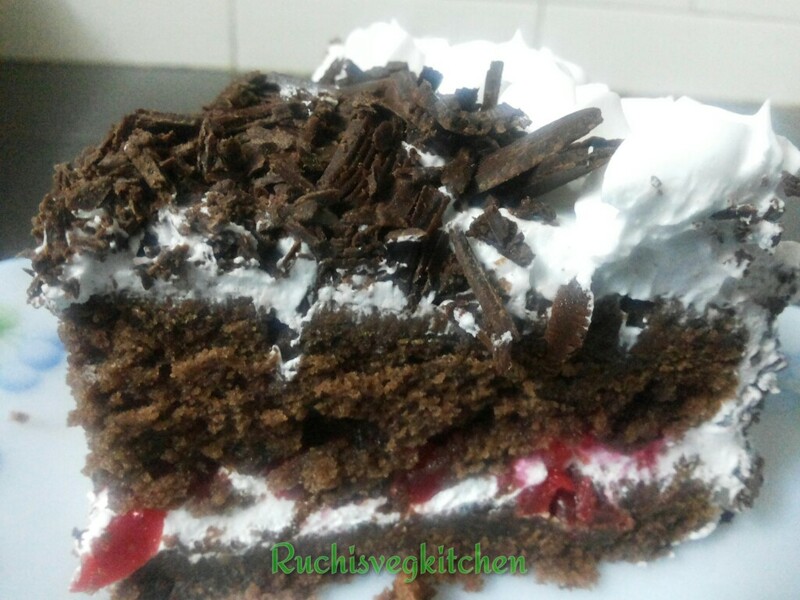 A Perfectly moist, spongy and delicious cake with flavours of Strawberry and Cherry. 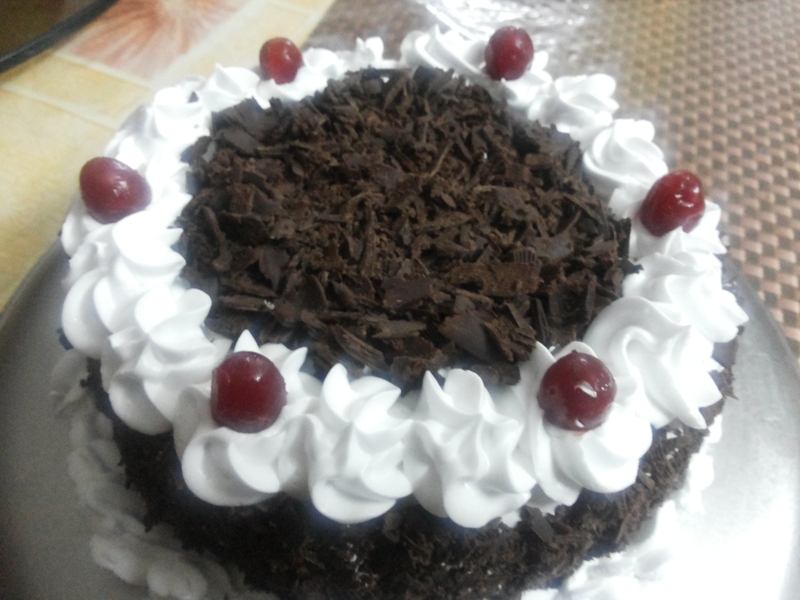 Prepared this cake on Hubby’s birthday as he loves chocolate. 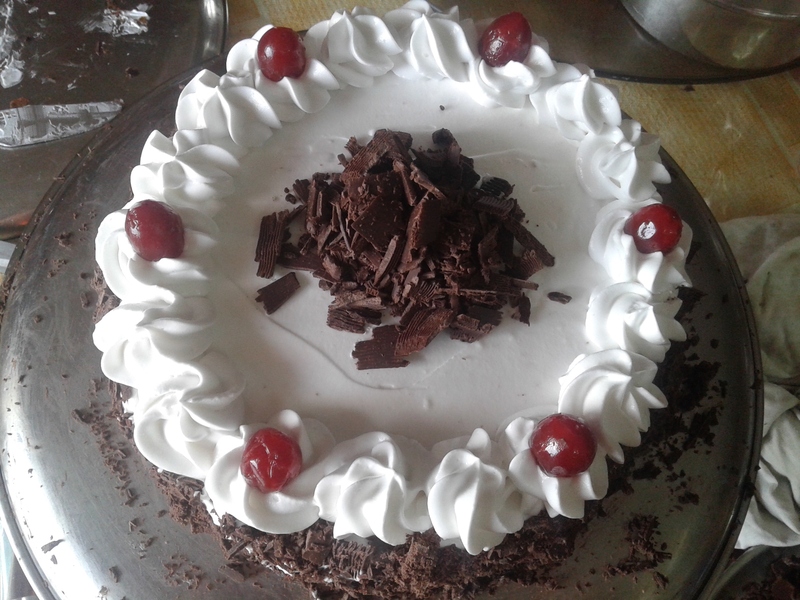 Though his favourite cake is butterscotch cake 🙂 :), he loved this. Place a stand in cooker and place cooker on slow flame gas. 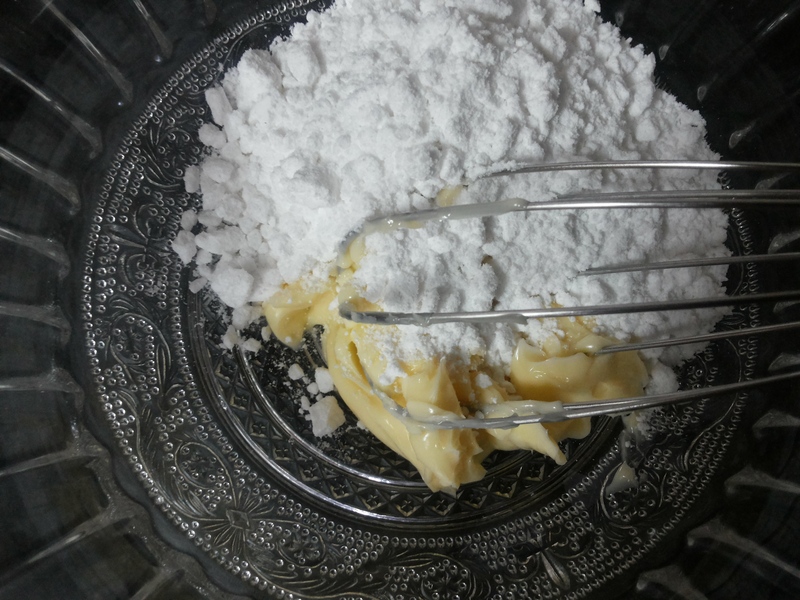 Sift together- Flour, Baking Soda, Baking Powder, and Cocoa twice. 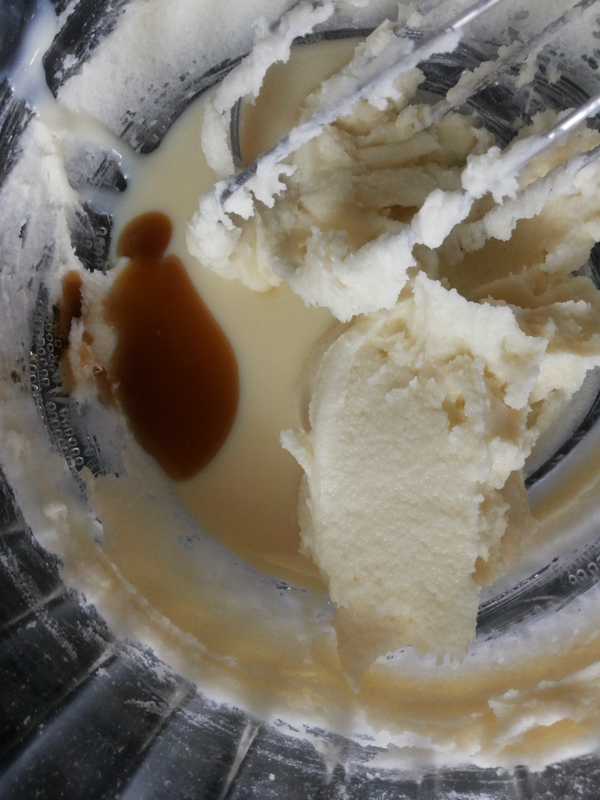 In a mixing bowl, beat the butter and sugar until creamed well. Now add in the vanilla and milkmaid. Beat well. Add in half of the milk and half of the flour mix. Mix well, now add rest of the milk and rest flour and mix well. 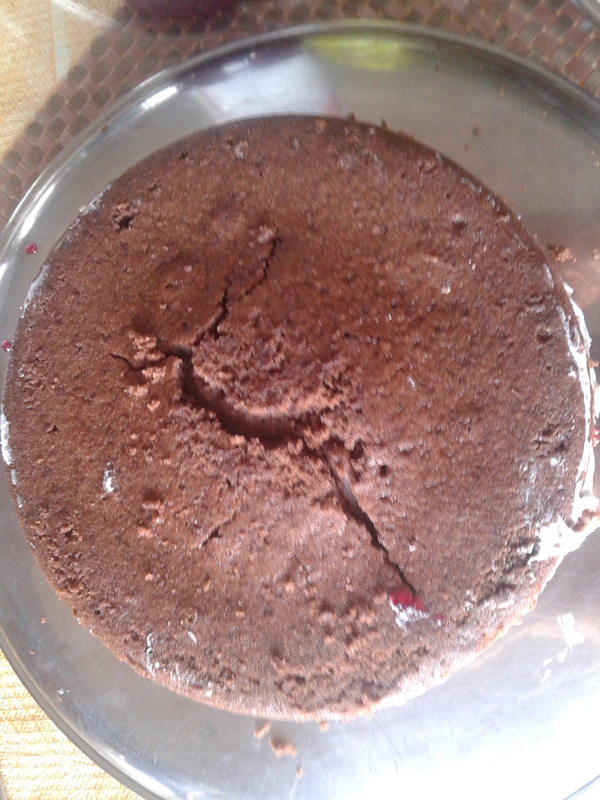 Grease a cake tin, and dust with some flour. Add the cake batter to it and cook it for 30-35 mins. Close the cooker lid without whistle. No water required in cooker. 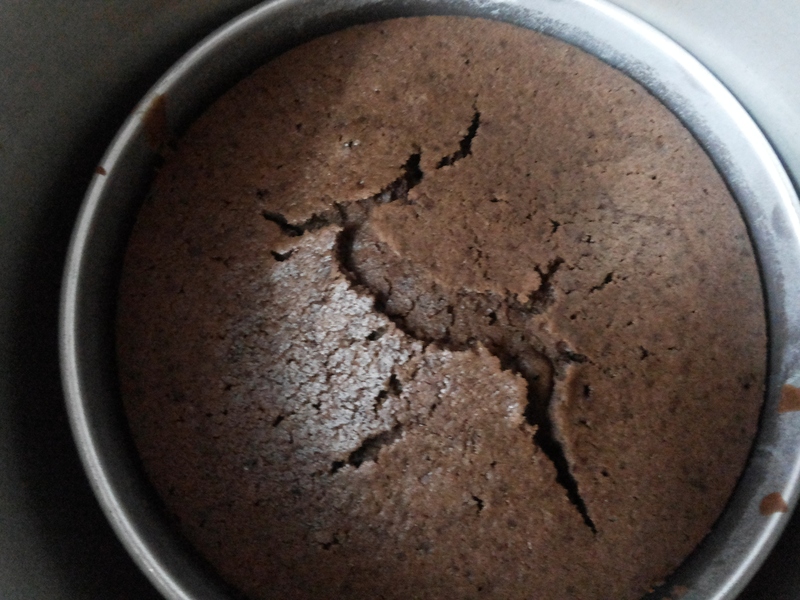 After the cake is baked, let the cake cool to room temp for at least 5 hrs. 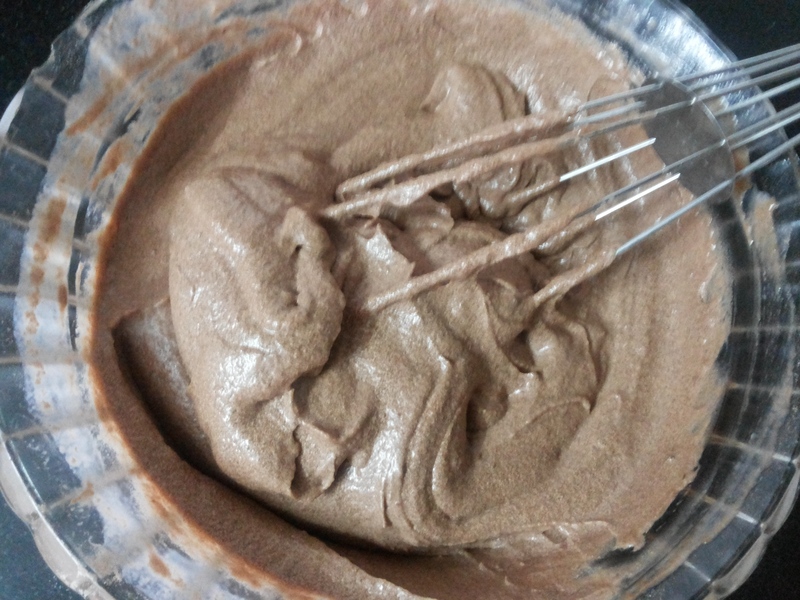 In a bowl, add the cream and beat it until soft peaks. 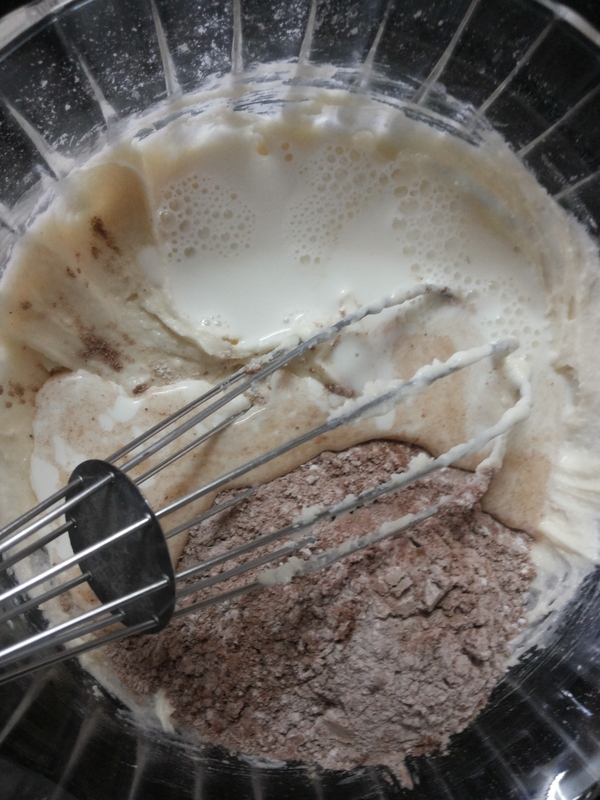 Now add in the sugar, Vanilla Essence and then whip until stiff peaks. Take ½ cup cherries and remove the seed of it. 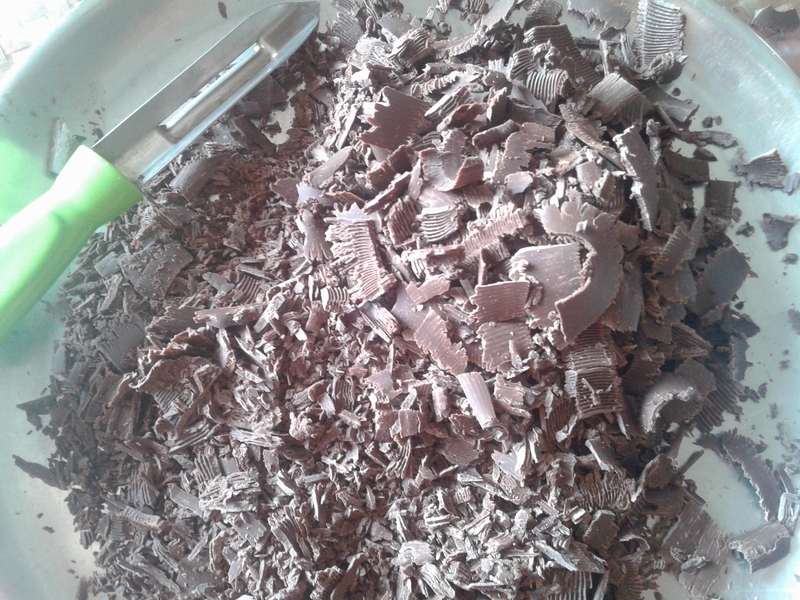 Peel the chocolate using a peeler to make the shavings. Then refrigerate until use. 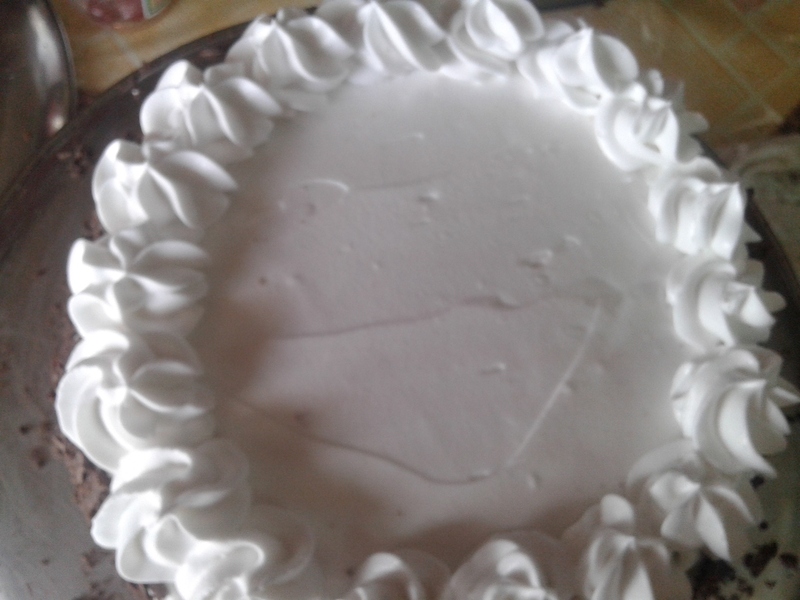 Now lets assemble the cake..
Take the sponge and level the top. 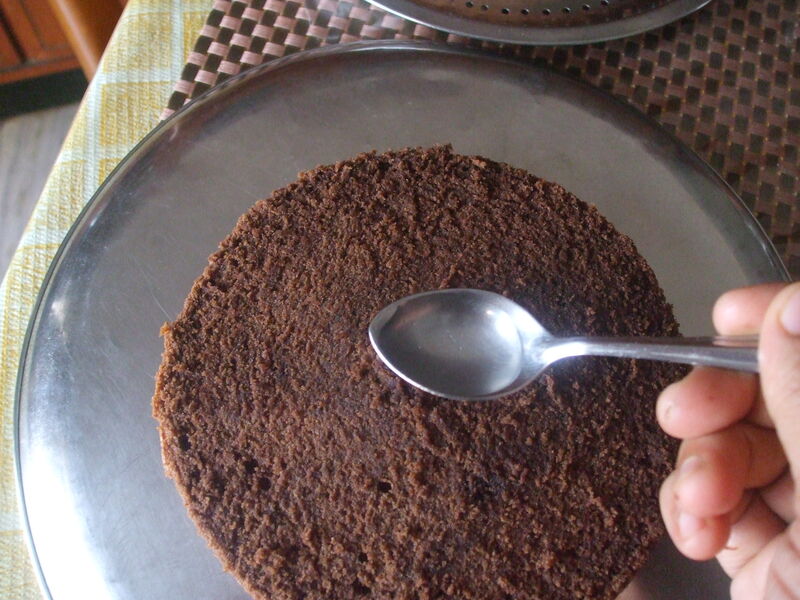 Now cut the cake into 2 layers using a big knife. Transfer the layers to a plate. To make sugar syrup take 2 tsp sugar and 7-8 tsp water. mix well till sugar dissolve. 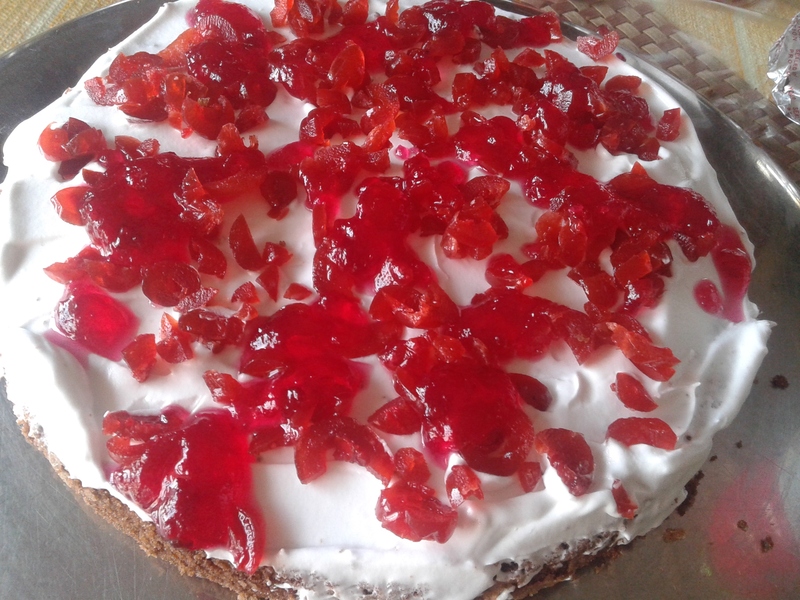 Take a bit of cream and apply on bottom now place the bottom most layer, spread 3-4 tsp syrup, now make a thick layer of whipped cream, now some chopped cherries and strawberry crush. Place the second layer and repeat the step of syrup. 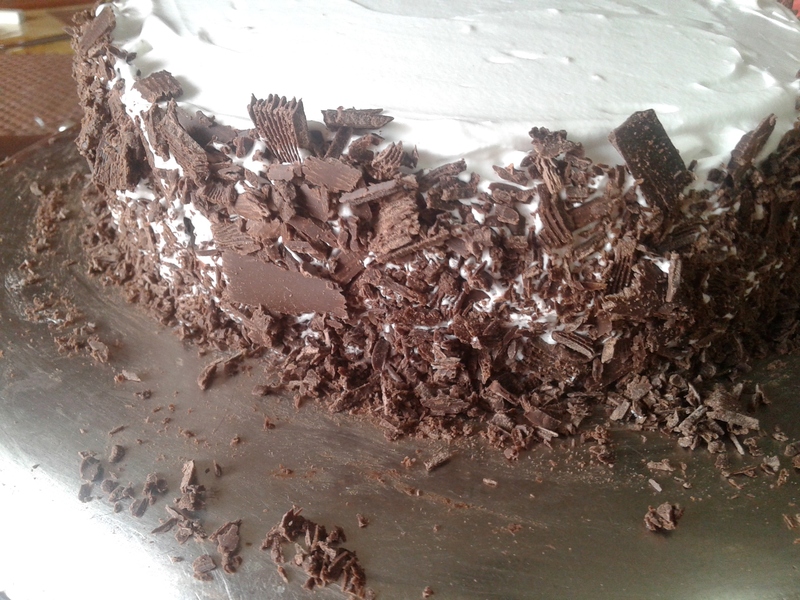 Now take a big dollop of cream and place on top..Now spread the cream using a big knife/palette knife. 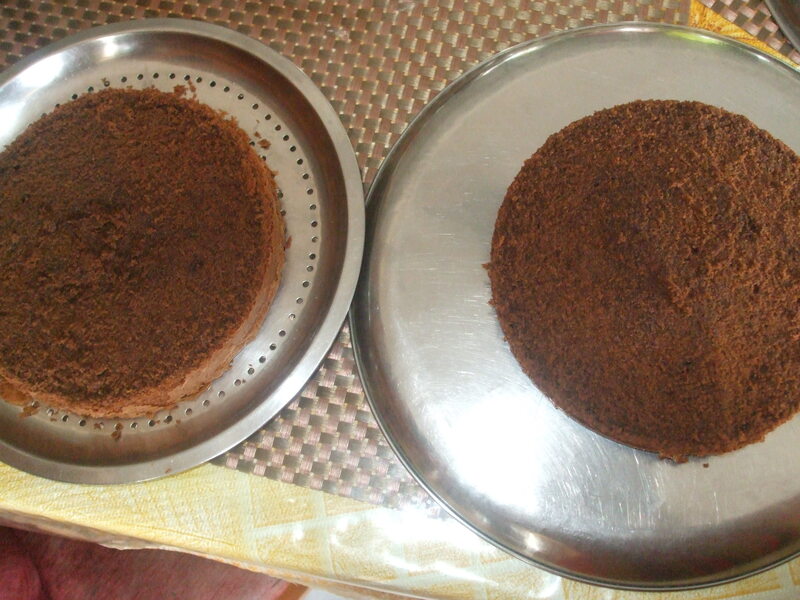 After spreading the cream on top, spread some cream in sides using the big knife and then freeze the cake for 30 mins. Now for the final icing: take a big dollop of cream and spread it on top as well as on sides using a big knife/palette knife. 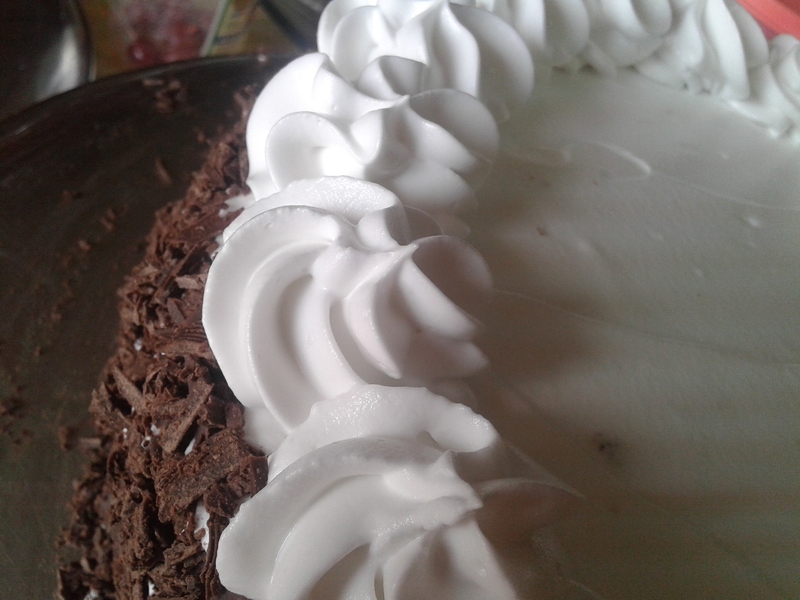 Add the remaining cream in a piping bag, make rosettes in top..Sprinkle chocolate in sides as well as in top.. And also make a border in the edge.. Put the remaining cherries in the top. 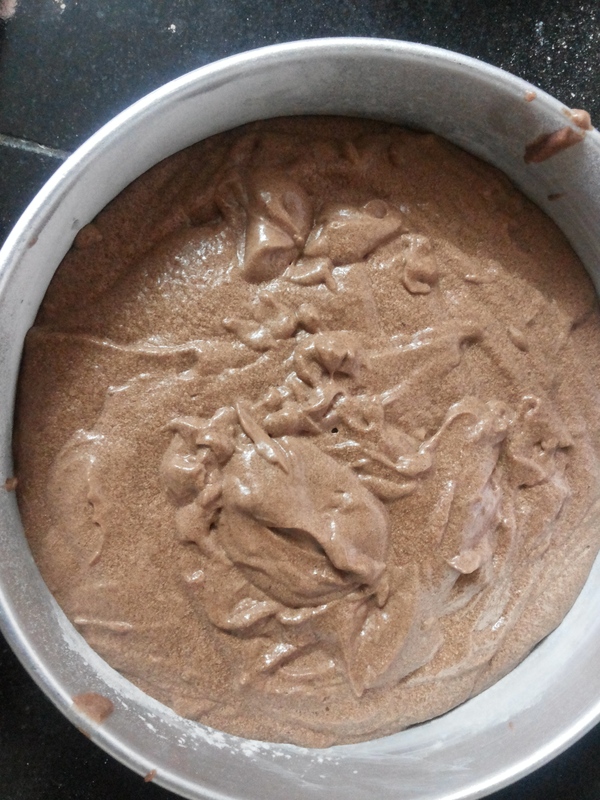 Refrigerate for at least 3-4 hours and enjoy! 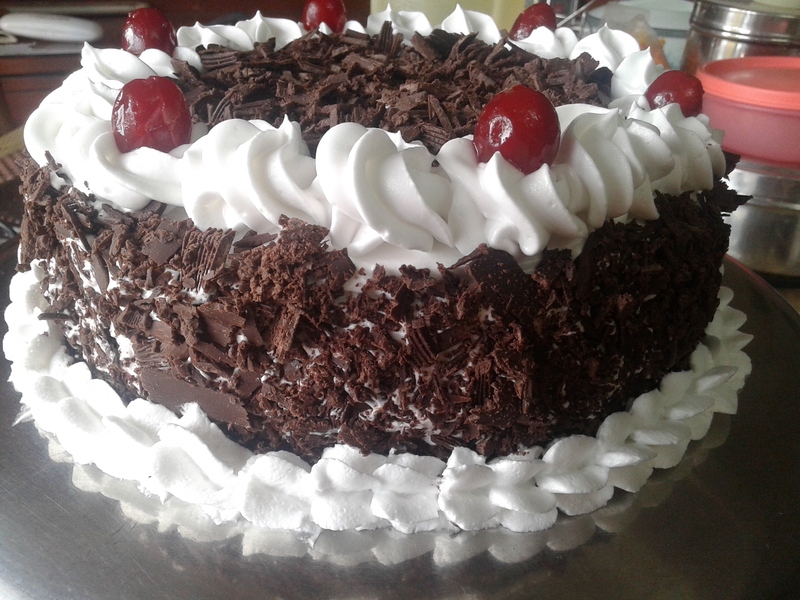 Hope you will love this cake . 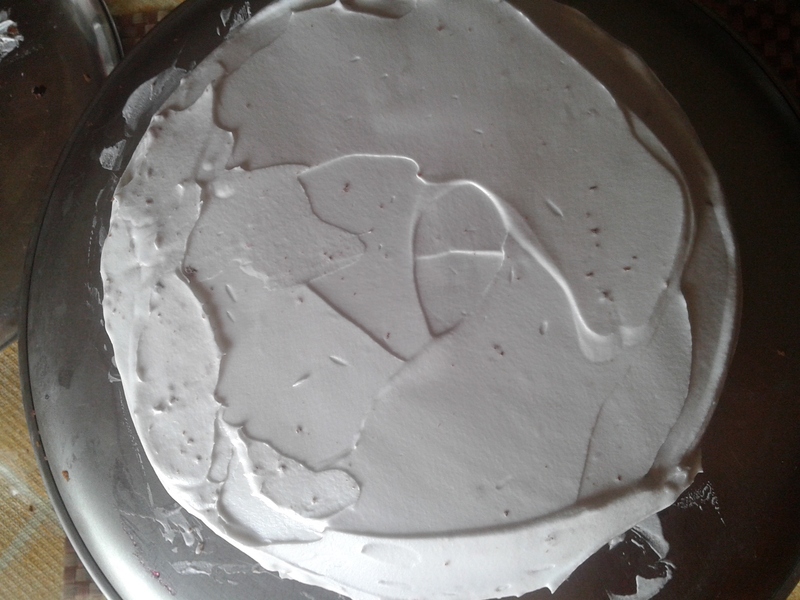 Hi Janki, well to keep in freeze best way is wrap cake with cling wrap and store. One can store for 2 to 3 days. 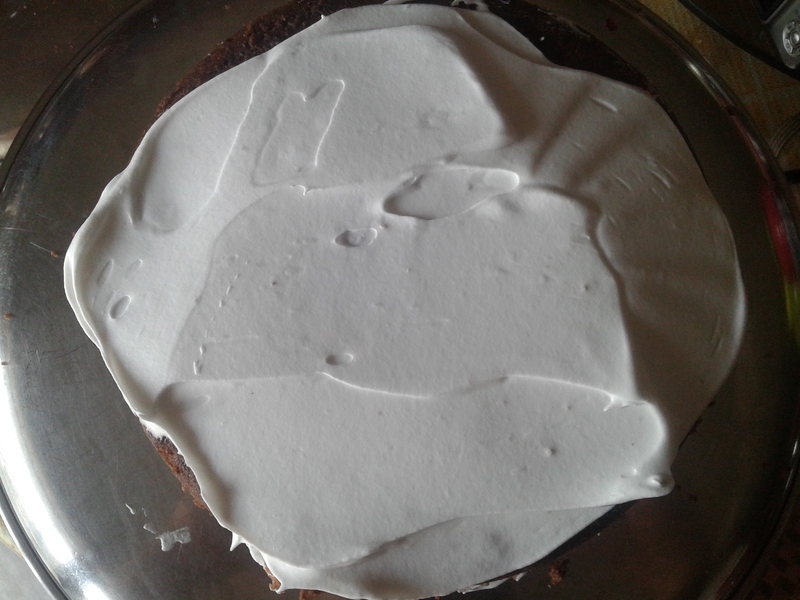 Pingback: Eggless Whole Wheat Pumpkin Spice Cake - LET'S COOK HEALTHY TONIGHT!